By clicking on the eye, information about the job is displayed in the right hand pane (although this is not very readable). 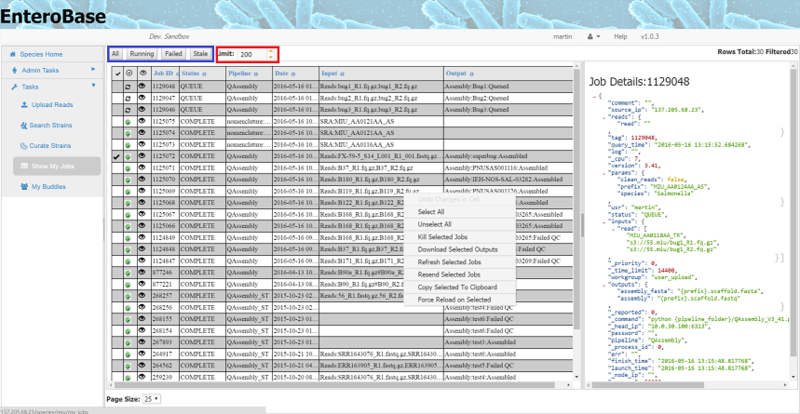 When the page first loads information about the top job in the table will be displayed in this pane. Usually all jobs are run automatically, once your assembly job has finished, nomenclature and any other jobs that act upon the assembly will be initiated. In addition every hour all databases are automatically checked and any outstanding or failed jobs are resent. However, in certain circumstance jobs can be manipulated by right clicking on the grid which brings up the context menu.